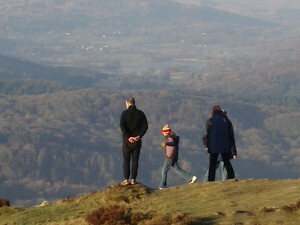 Gummers Howe is a hill which overlooks the southern end of Lake Windermere and provides a popular short walk with great views of the lake itself, the Langdales, the Coniston fells and the fells above Ambleside including the Fairfield Horseshoe. If the weather is kind you might also see the Howgills and Ingleborough. 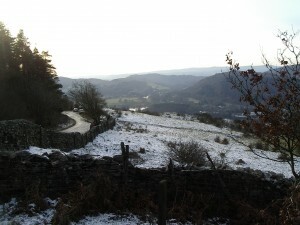 The route starts from Astleys Plantation Car Park on the Newby Bridge to Kendal road and half of the ultimate height of 321m or 1054 feet at the trig point is taken out by the drive up the hill. After crossing the road and walking 50m uphill along the road begin the walk at a gate. The path is obvious and not too strenuous until you get close to the summit when it becomes less distinct and rocky. Enjoy the views from the top. Look down at the Lake steamers, catch a glimpse of snow on Fairfield. To return you can either go back the way you came or follow the path over the top and around to meet the original path again. I must have done this short walk about thirty times over the years but I have never seen the view so clear as it was on Sunday. It was cold and sunny with a slight haze to the south but we could see all the fells very clearly.